1.7 x 5.1 x 0.9 in. 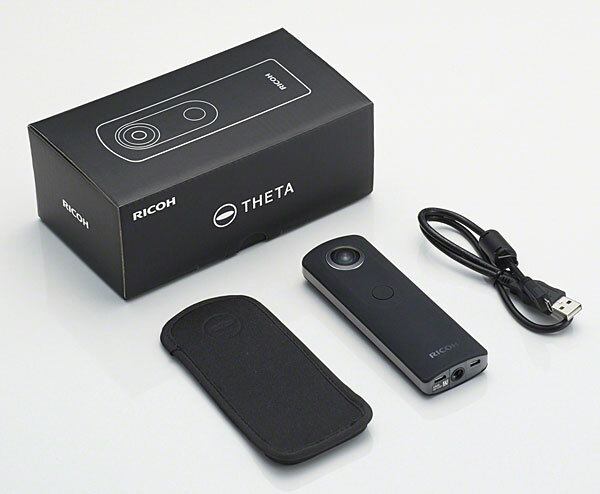 The Ricoh Theta S began shipping from October 2015 in some markets, with a retail price of around $350. In the US market, availability is slated for November 2015. The pricetag is a $50 premium over list pricing for the earlier Theta M15 model at launch, but still $50 below initial list pricing of the first-generation Theta. A variety of body colors are available in some markets, as you can see above; our understanding is that only the black version will be available in the US market. Special update: The Ricoh Theta S was named Most Unique Camera in our 2015 Camera of the Year awards! Ricoh's 360-degree panoramic pocket camera now enters its third iteration, and with it come some solid improvements across the board to both image quality and resolution, as well as video capture and what you can do with your creations post-capture. 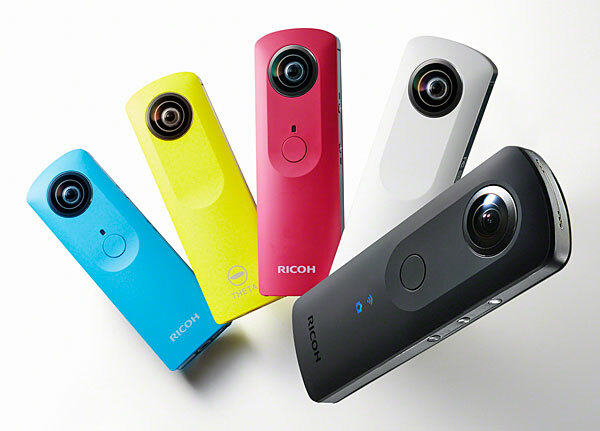 Initially unveiled back in 2013 as a concept device, the Ricoh Theta was officially announced later that year, sporting a much slimmer, sleeker design with small bulbous lenses on either side. The camera quickly and easily captured full 360-degree still images using the device's dual ultra-wide lens design, and automatically stitched these spherical images together. Updated again last year, the Theta M15 added full 360-degree video, though these videos could only be captured in short clips with a very low frame rate. Also added was an SDK to allow software developers to make apps that tied-in with the Theta's video and still capabilities. So what's new? A key change is a switch to even brighter lenses, each of which boasts a whopping 190-degree field of view, allowing them to see behind themselves slightly to provide for stitching to create a single image or video. The new lenses each have an f/2.0 aperture, noticeably brighter than the f/3.5 aperture of the earlier Theta models. The Ricoh Theta S' lenses are optically folded to keep the camera's thickness to a minimum. In this top-down diagram, the lenses are shown in dark blue at top and bottom. The copper-colored square at center consists of two prisms, each of which folds the light 90 degrees towards the sensor which corresponds to that lens. 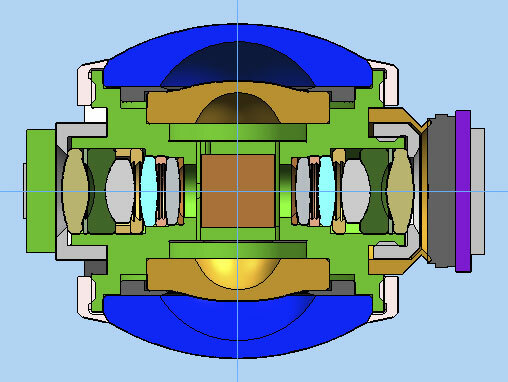 The sensor assemblies are at left and right of the image. As well as the brighter lenses, Ricoh has also switched to new image sensors that are both larger and much higher resolution than in earlier models. The sensors don't actually sit in between the lenses, incidentally: Through clever use of a dual prism, Ricoh folds the optical path for each lens in opposite directions, feeding light to sensors which sit on either side of the lenses. Information on the size of the sensors in the original Theta cameras isn't publicly available, but we do know that each of the two sensors had a resolution of five megapixels. That's now been boosted to 12 megapixels per sensor in the Theta S.
While that provides a total resolution of 24 megapixels before stitching, the final output resolution is rather lower at 14.5 megapixels (or 5,376 x 2,688 pixels). 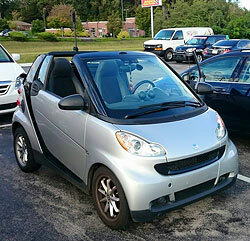 That's still far in excess of the 6.4-megapixel output provided in the earlier cameras, though. Previously, images would be stitched and then have noise reduction applied, but in the Theta S there is noise reduction performed on the raw image data, then it is converted to 8-bit and a second round of noise reduction performed, and then finally the cleaned-up imagery is stitched to create the resulting spherical panorama. As well as the improvement in lenses and image sensors, the Ricoh Theta S also sports significant upgrades in the video department. 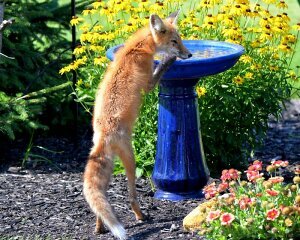 Full HD (1,920 x 1,080 pixel) video was a new feature in the M15, but due to a short clip length of just three minutes and a low capture rate of 15 frames per second, it was likely overlooked by many users. The Ricoh Theta S' is now a much more capable video shooter. The full scene is recorded at Full HD resolution for as long as 25 minutes at 30 fps, and you can then pan around to view in any direction. Still, some certainly used it to good advantage once YouTube added support for 3D videos, and now they'll be able to get even more utility from the feature. The video recording time has been increased more than eight-fold to 25 minutes, and the frame rate doubled to 30 fps, an accomplishment which apparently required significant work on getting heat out of the camera. With that said, the clip length varies depending on the ambient temperature . If the air temperature climbs to 104°F / 40°C, Ricoh's press materials suggest that the clip length could still drop to three minutes to avoid overheating which might damage the camera. It's also important to note that while the videos are shot at Full HD resolution, the result is a 360-by-180 degree image with extreme distortion, and to obtain a watchable video you'll typically want to view only a portion of that video at any one time. The previous video was hosted on Ricoh's own Theta360.com service, which has a very short clip length limit. This is the same clip as above but in its entirety, and hosted on YouTube. There's one notable difference between the two services, though -- while Theta360.com allows viewers to zoom in and out of the video, YouTube has a fixed viewport size. Want to see the original file, straight out of the camera and complete with the distortion required to save a spherical panorama in a flat image? You can download it here for use in Ricoh's software. This can be achieved on YouTube and in Ricoh's free software automatically, allowing the user to pan around and focus their attention on whichever subject grabs their interest, but the result will be at a much lower resolution. And we can't tell you precisely what that resolution would be, since it will vary depending on your zoom level. Ricoh's app allows you to zoom in and out as well as panning the clip while you're watching it, but Google uses a fixed (and unspecified) zoom level on YouTube, only giving the viewer control over panning direction. Incidentally, if you'd like to try Ricoh's app for yourself, you can download it here for Windows, Mac OS, Android and iPhone devices. We're also including links throughout this review to the original JPEG and MPEG-4 files straight out of the camera, so you can play with them to your heart's content. Of course, the Theta 360 can shoot spherical panoramic stills, as well. One very nice touch is that these can be automatically rotated to correct your horizon. For this particular shot, the camera was actually held upside down by IR publisher Dave Etchells' leg. There are a couple of very nice touches in Ricoh's bundled software, incidentally. For one thing, since the Ricoh Theta S includes a 6-axis accelerometer and compass, you can orient the camera in any direction and it will right-correct the horizon automatically, both for stills and video. If you look at the original, heavily-distorted JPEG or MPEG-4 file, you'll see the actual angle at which your creation was shot, but once it's played back as a pannable still or video, the correction is applied for you at the same time. Another nice feature of the bundled software is a "Home Position" button that restores your view to the default orientation and zoom level. Particularly with videos, it can be a bit easy to lose track of your orientation as you pan and zoom to look at the subjects which interest you, so it's nice to have a one-click control that returns you to a straight and level view. No question about it: With a total resolution of 14 megapixels for its panoramas, the Ricoh Theta S captures vastly more detail than did its predecessors, which output at just six megapixels. While the Theta S is neither waterproof nor otherwise as rugged as a GoPro, another accessory allows it to be used in rainy or dusty environments or even underwater, as well. It looks a bit like a chunky test tube with a removable cap and tripod mount at one end, and allows spherical stills and video to be shot at depths of up to 12 feet. We're not sure if the video recording time would be affected -- after all, placing the camera inside a sealed plastic tube is going to make it harder for heat to dissipate -- but even so this is a pretty nifty accessory, and one we'd imagine more than a few Theta S owners will want to pick up. And with the Theta S inside a sealed tube, you can't reach it to press its shutter button, either. (Ordinarily, this would allow you to shoot without first connecting to your smartphone, but that's only going to work without the housing.) So how can you shoot stills and video underwater? Well, the answer's surprisingly simple. There's an interval timer function which will trip the shutter on your behalf, and since you're shooting a full 360-by-360 degree sphere which automatically corrects for the horizon, you don't even need to worry about framing. Hence no control or connection to the camera is actually needed: Just set the interval timer running or start movie capture, then put the camera in the tube and you're set to go! Ricoh notes that Wi-Fi transfers with the Theta S are much faster than in earlier models. The transfer speed has quadrupled from a claimed 2Mbps to 8Mbps, however with the increase in resolution, that actually translates to somewhere around a 30% improvement in how long it takes to transfer each image. Using the smartphone, the social sharing options of the Theta S videos and stills has been expanded beyond Ricoh's own Theta360.com site. You can now send videos to YouTube's dedicated 360-degree video channel, which lets you watch streaming 360 video with full directional interactivity. The apps also give you Twitter and Facebook links for quick sharing. And last year, Ricoh teamed up with Google to add Theta support for user-submited 360-degree panoramas into Google Maps, but now the Theta S takes it a step further. The new companion smartphone app is based on the Open Spherical Camera interface from Google. Now Ricoh Theta S images are supported by Google's brand new standalone Street View app for Android and iOS devices, allowing you to export your spherical imagery straight to Google Maps! The obvious question here is whether this means that Google Maps could suddenly become inundated with imagery that's not safe for work, and the answer to that is no. Although Google tells us that it won't be censoring users' self-uploaded content -- hiding faces and license plates, for example, as it does with its own imagery -- it will be requiring submissions to be approved. This process will be partially automatic, but with a level of human intervention for edge cases. The automatic algorithms will approve imagery deemed safe automatically, and reject that which is deemed inappropriate for Google Maps. Imagery which falls somewhere in between will be checked by a human, and then approved manually. Once users have built a reputation for uploading significant amounts of safe content, they'll be given a longer leash and their images will be approved more quickly. The Ricoh Theta S isn't alone in being supported by this updated version of Google Maps -- you'll still be able to upload panoramic imagery shot with other devices, including the Photo Sphere functionality provided by Google's own Android camera app -- but there's no question that its one-click-and-you're-done interface will make the Theta S about the easiest way to get your images into Google Maps. And in the process, the DIY Google Maps functionality will give businesses yet another reason to consider the Theta. Imagine being able to add Street View imagery for your company's retail stores with a minimum of fuss, for example. And the Theta S now also supports streaming of content, although there are some provisos in this area. Unlike some devices which allow live streaming via Wi-Fi, the Theta S streams via either USB or HDMI, so you'll need a physical tether to the device from which you'll be uploading your stream. And at launch, at least, the HDMI tether won't provide a stitched image as would USB: Instead, you'll be able to stream two non-interactive fisheye images (one per lens) via HDMI. This may change at a later date, however. 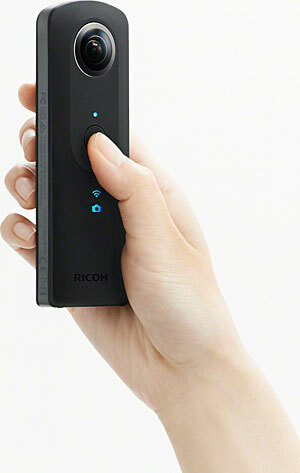 The Ricoh Theta S' controls have been tweaked slightly, and a column of indicator lamps (some of which are illuminated above) has been added to its front panel, making it more user-friendly when used without your phone. There's no display for a live view, obviously, but it's not really necessary when everything in sight will be captured. 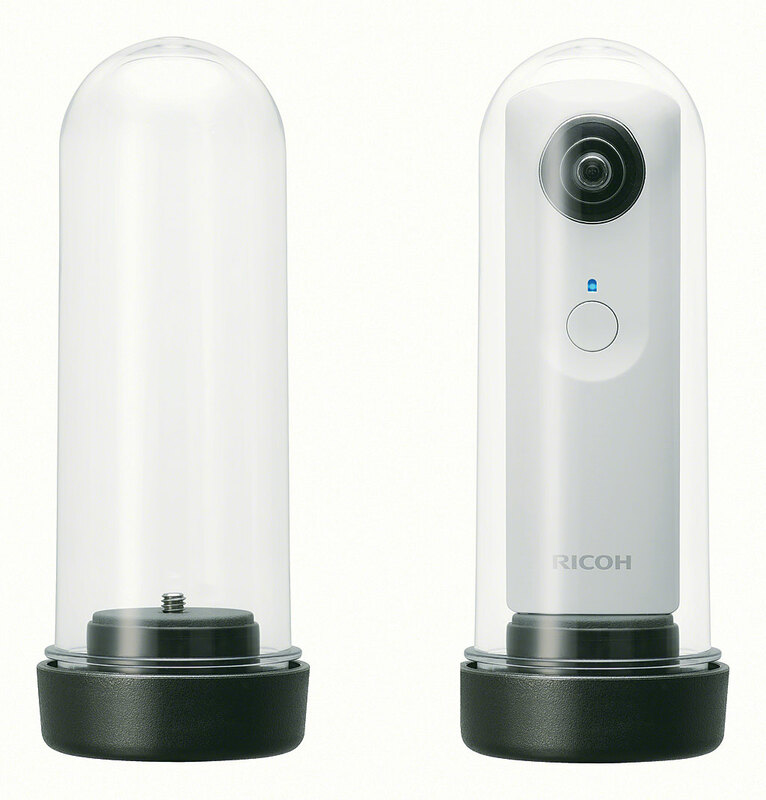 Physically, the new Ricoh Theta S looks very similar to its predecessors. Overall, it's slightly thicker than the previous models, giving a little extra room for the two brighter lenses, a slightly larger (both in size and capacity) built-in lithium-ion battery pack, and larger heat sinks on the image sensors. There are also several new controls and indications, giving the Theta S a simpler interface that works better when you're not paired to your phone. 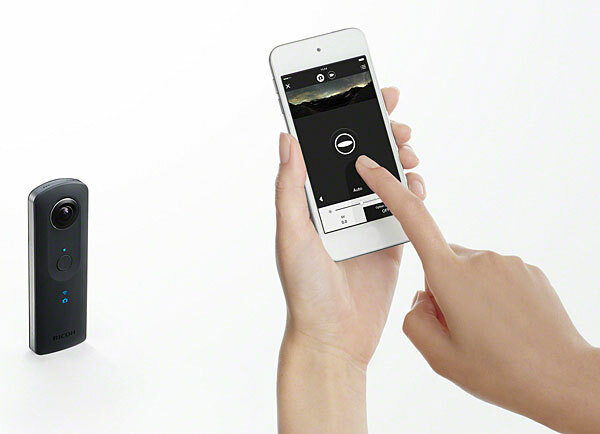 Physical controls include a dedicated power button, Wi-Fi button and mode selection button. There are also indicators on the front of the camera to show whether it is in still or video mode, Wi-Fi tethered or still connecting, whether it is currently recording, and if you're running out of memory. As in the past, there is no way to upgrade the memory of the Theta S, as it lacks a card slot. However, the built-in memory has been doubled from 4 to 8GB, a change which is very welcome considering its much higher resolution and the greater video frame rate / clip length, all of which will put much greater demands on that storage. All connectivity is still on the bottom of the camera: A USB port, HDMI port, and a standard tripod socket. The Ricoh Theta S is very, very different. In fact, it's probably one of the most unusual cameras we've ever received for review, and that's one of the things which made me really want to get my hands on it as soon as it landed in the office. What did I think of the unusual Ricoh Theta S? No question about it, our review of the Ricoh Theta S has been very different indeed -- as befits a camera so unique as this one. Usually, we pair the analytical with the subjective in our reviews, poring over every fine detail in the lab before we head out into the real world with an idea of where the camera's strengths and weaknesses might lie beforewe start shooting. With the Ricoh Theta S, we simply couldn't do that. The Theta S' unique twin-lensed design and complete 360-degree spherical panoramic coverage might have yielded an interesting behind-the-scenes look at our testing process, but it certainly wouldn't have provided meaningful results about the camera itself. And so rather than try to run it through our standard tests, I did something for this review that I've not done in quite a long time: Focus solely on my real-world experiences without concern for the minutiae of lab test figures. Want to know what we think of this incredibly unusual camera?